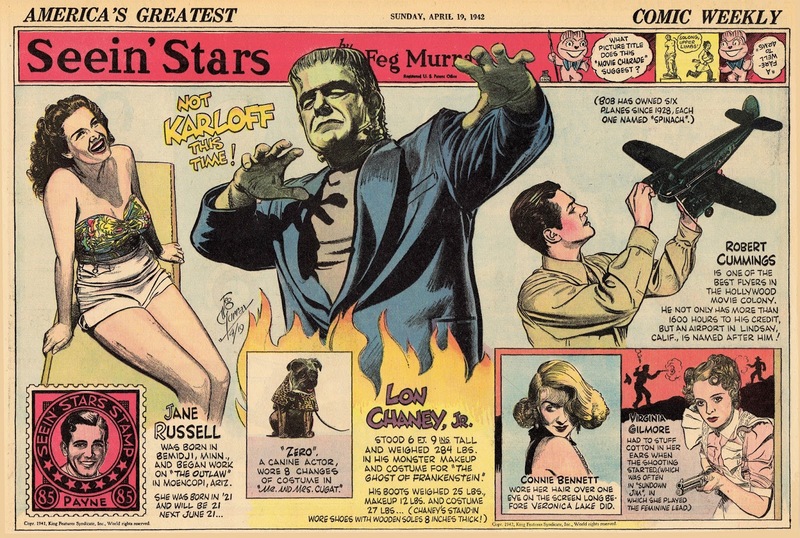 I've always liked whatever samples I've seen of the vintage newspaper feature, Seein' Stars by Feg Murray -- and when I recently ran across a batch of strips featuring the Frankenstein Monster, I couldn't resist grabbing them for my collection. Since these have rarely been seen since their initial publication, I thought I'd share them here. I tweaked the scans a little for the web -- making the solid blacks richer and cleaning up some "see through." The scans are large, so you can really see the linework. The strips' dates range from 1941 to 1948. I have a duplicate of the third strip shown here -- and would consider trading it for other Seein' Stars strips featuring Frankenstein, Bela Lugosi or other horror stars. The last strip shown was one I purchased on line -- only to later find out it was listed in error and no longer available -- picture snagged from eBay.